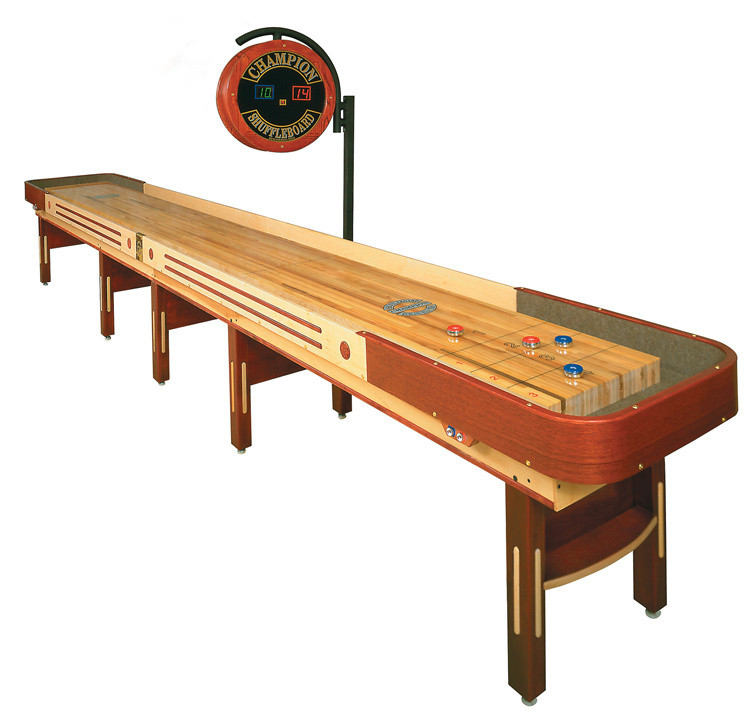 A shuffleboard is a table designed for playing the game of shuffleboard. It’s built around the playfield, usually a single piece of premier maple timber that’s been precisely flattened, honed and treated with a low-friction coating. They start at around 9ft in length and go right up to the regulation size of 22ft. The playfield is marked with a numbered scoring zone. Some tables have a scoring zone at each end of the playfield, whilst others are marked at one end only. Some playfields are profiled with a concave shape, which can help to keep pucks on the table and add another dimension to the game. The playfield should be kept spotlessly clean for optimal performance. In addition, a silicone powder is sprinkled over it. Although it’s also called shuffleboard wax or shuffleboard sand, this powder is actually made of countless tiny silicone balls. It helps pucks to skim the table smoothly and comes in a variety of grades, ranked by friction or speed. The main body of the table is called the cradle. This can be made out of any kind of wood, but most commonly it’s maple or oak. The cradle can be uniquely finished with woodstains, paint, cosmetic details or anything else. There is a gap between the cradle and the playfield, creating a gutter into which pucks can fall. The legs will be strong, designed to support the weight of the entire table. Usually braced in some way, each foot will be fitted with a level adjuster, which allows the operator to accurately level the table for a perfect, straight glide. Shuffleboard tables are often made to order, giving you the option to personalise your table with a custom finish or woodstain, or to add a logo to the playfield. You can add score displays or abacuses, and some tables are built to be used outdoors. 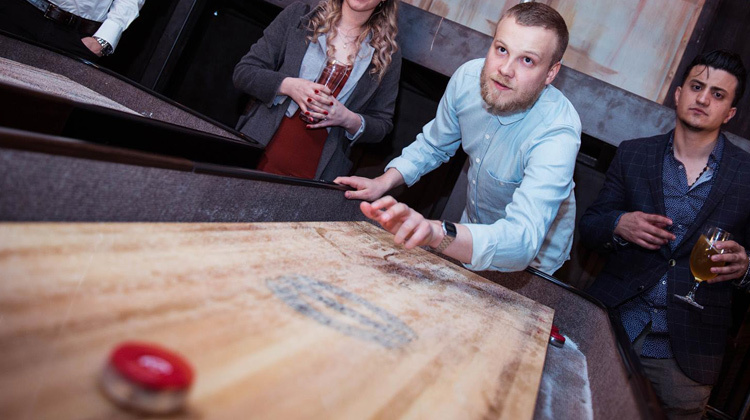 Choose your shuffleboard table carefully and it will repay you with decades of reliable, fun gameplay. Our range of Champion shuffleboards are widely renowned as the best in the business, with long warranties, patented game features and unparalleled performance.